One of the great things about gardening is that in some ways your garden can take care of itself. Now I’m not endorsing abandoning your garden chores completely, but there are a few things that you can do to make your work a little easier. One of these things is to select plants for your garden that will help control insect pests. Certain plants contain properties that either invite beneficial insects or repel harmful insects. Beneficial insects prey on pests that cause damage in the garden. Ladybugs and praying mantis are good examples of beneficial bugs. Using plants for pest control not only cuts down on your workload, but it also reduces the amount of insecticides that you use in your garden. And fewer insecticides means more good bugs, which in turn means help in controlling bad bugs. Remember that what works in my garden may not work in yours. Every garden is different with its own microclimate, soil type, and pest control issues. It is important that you experiment to find out what works best for your situation. With this thought in mind, it also helps to choose plants that are native to your area. This way beneficial insects will already know what to look for. Artemisia – This plant produces a strong antiseptic, although not unpleasant aroma that repels most insects. Planted in drifts it can also deter small animals. My favorite variety is ‘Powis Castle’. I prefer to use this plant in flower borders and not in my vegetable garden because it produces a botanical poison. Basil -The oils in basil are said to repel thrips, flies, and mosquitoes. I plant basil alongside my tomatoes for larger, tastier tomatoes. However, basil and rue should not be planted together. Bee Balm – I love this plant because it attracts bees to my garden. It is another plant that you can grow with your tomatoes. Borage – This plant is a real workhorse in the garden. It repels tomato hornworms and cabbage worms and attracts beneficial bees and wasps. Borage also adds trace elements to the soil. This is an annual but readily comes back each year from seed. Catnip – I think that this plant repels just about everything, except for cats of course! Use it to keep away flea beetles, aphids, Japanese beetles, squash bugs, ants, and weevils. I use sachets of dried catnip to deter the annual parade of ants that invade my kitchen. My favorite variety of catnip is ‘Six Hills Giant’ because of its proliferation of sky blue blooms. Chives – Chives are one of my favorite herbs. Not only do I love the flavor but their grassy foliage and round flower heads also add so much interest to my garden. You can plant chives to repel Japanese beetles and carrot rust flies. It has also been said that chives will help prevent scab when planted among apple trees. Chrysanthemums – When I do use an insecticide I use one made from chrysanthemums called pyrethrum. This all-natural pesticide can help control things like roaches, ticks, silverfish, lice, fleas, bedbugs, and I like to use it to control ants in certain parts of my garden. In the garden white flowering chrysanthemums are said to drive away Japanese beetles and C. coccineum, commonly known as Painted Daisy, kills root nematodes. Dahlias – I have a renewed appreciation for these old fashioned favorites. Dahlias repel nematodes and the blooms are great for adding bold splashes of color to flower borders and fresh arrangements. Dill – I always find a place for this plant in my garden. Dill is best planted with cucumbers and onions. During the cool season I plant it with my lettuce. Dill attracts hoverflies and predatory wasps, and its foliage is used as food by swallowtail butterfly caterpillars. Tomato hornworms are also attracted to dill, so if you plant it at a distance, you can help draw these destructive insects away from your tomatoes. Dill repels aphids and spider mites. I like to sprinkle dill leaves on my squash plant to repel squash bugs. Four O’Clocks – This plant is a favorite food for Japanese beetles. However, because of its poisonous foliage rarely do they get to finish their meal. It is important to note that Four O’Clocks are also poisonous to people and animals, so avoid planting it if you have small children or pets. Garlic – I could write endlessly about garlic. I love the stuff. In addition to its great taste and health benefits, garlic planted near roses repels aphids. It also deters codling moths, Japanese beetles, root maggots, snails, and carrot root fly. Hyssop – This is another one of my favorite plants. Hyssop is great for attracting honeybees to the garden. Lavender – I can’t imagine my garden without lavender. I just love its fresh scent and delicate blue blooms. Lavender is a favorite among many beneficial insects and also repels fleas and moths. Marigolds – The marigold is probably the most well-known plant for repelling insects. French marigolds repel whiteflies and kill bad nematodes. Mexican marigolds are said to offend a host of destructive insects and wild rabbits as well. If you choose marigolds for your garden they must be scented to work as a repellant. And while this plant drives away many bad bugs, it also attracts spider mites and snails. Nasturtiums – I plant nasturtiums with my tomatoes and cucumbers as a way to fight off wooly aphids, whiteflies, squash bugs, and cucumber beetles. The flowers, especially the yellow blooming varieties, act as a trap for aphids. Petunias – I plant petunias throughout my garden just because I love them so much. As an added benefit they repel asparagus beetles, leafhoppers, a range of aphids, tomato worms, and a good many other pests. 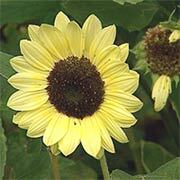 Sunflowers – I use sunflowers as a way to draw aphids away from my other plants. Ants move their colonies onto sunflowers. The sunflowers are tough enough that they suffer no damage.